A recent exhibit at the Nasher Sculpture Center in Dallas, Texas, asked visitors to view stone tools not as artifacts but as works of art. The curators—artist Tony Berlant and anthropologist Thomas Wynn—displayed hand axes without context, which encouraged patrons to see the lithics as aesthetic objects rather than tools. Even more provocatively, the exhibit presented stones that resemble human faces as “figure stones.” Such interpretations are often ignored or downplayed by scholars interested in modern human behavior; art tends to be viewed as a rather recent human invention, a practice that dates to well after the emergence of Homo sapiens. The delineation of such artifacts as art is dismissed as the result of wishful thinking on the part of biased collectors rather than aesthetic creations by early hominins capable of complex thought. Skepticism of extraordinary claims is important, after all. However, we may be too quick to disregard this approach. For much of the intellectual history of archaeology and paleoanthropology, the material and fossil records were viewed though a Eurocentric mindset that assumed linear progression with Western civilization as the apex of human evolution (see Kuljian 2016 for more on this). As our knowledge of the human fossil record expanded in the twentieth century, it became clear that the origins of H. sapiens dates to at least 200,000 years ago (with recent evidence from Jebel Irhoud in Morocco placing this closer to 300,000 years ago). By the 1990s, archaeologists noticed an apparent disconnect in the data: while the fossil record suggested our species was old, the archaeological evidence did not show humans acting in a “modern” way, producing art and complex technologies, until much more recently. The assertion that anatomical modernity preceded behavioral modernity has been the subject of much research over the last few decades. At its heart, this evolutionary approach is predicated on the idea that there is a clear, and archaeologically visible, dividing line between humans who act in a modern way and those who do not. This change, sometimes argued to be due to a single genetic mutation, is seen as driving the evolutionary success of our species, with humans thinking in new, cognitively complex ways able to outcompete other populations or species. Yet, it is also based on a specific way of looking at the record and, occasionally, a distinctly Western definition of what constitutes early art. By at least 300,000 years ago, members of the genus Homo were engaging in complex, creative thought and producing artifacts laden with meanings. This reticence to accept the idea that non-modern humans could create works of art is part of the larger claim that only H. sapiens are capable of symbolic thought. Scholars have tried to use the archaeological record to pinpoint when humans evolved the ability to link a sign to the object it stands for simply because everyone agrees the connection exists. In other words, this link is not because it resembles the object (an example of iconic thinking, like a photograph of a car) or because it is directly linked to the object (indexical thinking, such as smoke being an index of fire), but because of an agreed upon convention (symbolic thinking, such as knowing a red light means stop). The use of symbols requires a sophisticated mind able to conceptualize beyond the literal world. Many studies contend that among the living primates, only humans possess this creative mental ability. But how far back in time can we trace our capacity for symbolic thought? Not surprisingly, claims of symbolic artifacts made by non-modern humans have been met with intense scrutiny. Part of this is due to the fragmentary nature of the early archaeological record, but there is also a deeply held assumption that only H. sapiens could produce such artifacts. When humans began to actively use and control fire is hotly debated (see Chazan 2017). Discerning anthropogenic versus natural fires involves understanding the differences between quick-moving grass fires and those that were tended to. Research by Sarah Hlubik and colleagues (2017) suggests fire use at a 1.5-million-year-old site in Kenya. Evidence of the presence of burned seeds, wood, and flint fragments from Gesher Benot Ya’aqov in Israel indicates that non-modern humans were using fire by approximately 800,000 years ago (Goren-Inbar et al. 2004), although it may not be until 500,000 years later that widespread fire use appears in the archaeological record. While most scholars focus on the technical utilitarian reasons for fire use (for cooking, protection, and warmth), there may be a more nuanced and important aspect—conversation and storytelling. Polly Wiessner’s (2014) study of evening campfire conversations by the Ju/’hoansi of Namibia and Botswana implies that it was during talks over firelight that humans engaged in non-subsistence related conversations that aroused the imagination; spreading rumors and spinning tales. As with fire, the origins of intentional burial are contested and debated. One of the earliest claims is the AL 333 fossil assemblage of Australopithecus afarensis, which dates to 3.2 million years ago, but there appears to be no direct evidence in support of this. The Sima de los Huesos assemblage (probably older than 300,000 years ago, although the exact date is disputed) may also represent an intentional burial, or at least the purposeful movement of bodies postmortem. Recent support for burial activity before (or in addition to) that of contemporary humans comes from the recent work on Homo naledi (Berger et al. 2017) at between 236,000 and 335,000 years ago. The remains found in the Rising Star cave system in South Africa may have been deliberately deposited by other members of their species. This sort of mortuary behavior does not necessarily imply symbolic thought, but it does suggest that something distinctively human is occurring earlier than once thought. For many archaeologists, the production of shell and stone beads is a critical step in the evolution of human thought. Beads are seen as markers of group identity and may indicate the desire to let someone else know who you are (e.g., “I’m from the group down by the river who wear blue-tinted shells”). Modern examples suggest that beads send multiple signals (Wilkie 2014). Of course, it is difficult to assess this in the past, yet the very act of creating these objects indicates awareness of the importance of social networks. The oldest shell beads come from the United Kingdom and may be 300,000 years old (Bednarik 1995) are around 200,000 years older than better-accepted examples from North Africa, Southwest Asia, and South Africa (Kissel and Fuentes 2016). At Blombos Cave in South Africa, archaeologists have identified a change in the way beadwork was created over time and interpreted this as a reflection of changes in the social norms shared by members of a Middle Stone Age community (Vanhaeren et al. 2013). 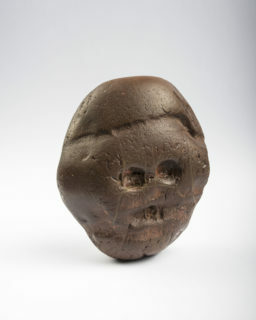 The three-million-year-old Makapansgat Pebble may have been selected and carried to a home site by an australopithecine who recognized in the naturally occurring markings something resembling a face (Bednarik 1998). Most scholars reject its status as symbolic. if we think of modern human origins as a process, rather than a single event, behaviors such as the curation of rocks and other items of embedded social meaning are important. 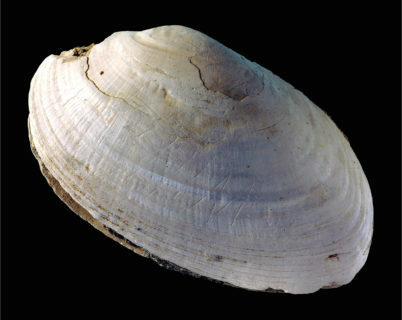 Recent work in Indonesia has uncovered examples of Homo erectus engraving lines on mussel shells (Joordens et al. 2015). This artifact dates to between 540,000 and 430,000 years ago and was engraved with a sharp object in a zigzag pattern. Were our human ancestors capable of producing abstract design? We will likely never know what this engraved mussel shell meant to its maker, but we are finding more evidence for what could be considered symbolic objects far earlier than previously acknowledged. Perhaps these earlier examples, which date to periods before H. sapiens flourished, are glimmerings of the capacity to engage in complex meaning making. Of course, it is hard to say what the function of these scratch marks was and whether fire and burial truly represented something novel. Archaeologists tend to divide objects and behaviors into two classes: utilitarian and nonutilitarian. Much effort has been expended in trying to find the functional significance of these objects and behaviors, partly to negate the hypothesis that they had symbolic meaning. Nevertheless, we must remember that the objects we use today can function in multiple ways. Toothbrushes are functional, but the fact that one can buy a $4,000 toothbrush suggests that modern humans can input meaning into many objects. Much of anthropology’s early history as a discipline is linked with narratives delineating who is human and who is not. Our intellectual forbearers often assumed that it made sense not only to put people into groups, but to rank them in a hierarchical manner. We then defined human behavior by what we think is unique and distinctive to humans. However, time and again we have seen that this assumed exclusivity is mistaken. Tellingly, as soon as we define a shared, derived trait for humans, another study comes along and shows that feature or behavior exists in non-modern humans. We thus get stuck in a sort of feedback loop asking, Do we redefine what it means to be human, or do we add more “types” to the human species? Today, anthropologists are working to reframe the questions we ask to be more inclusive. Definitions of what make us human can be based more on our shared evolutionary history rather than a specific cranial capacity. To be fair, the possible examples of meaning making in Homo groups prior to around 200,000 years ago are few and far apart. These are glimmerings, rare and potentially isolated occurrences that point to the complex nature of behavior in early non-modern humans. But these glimmers matter. By taking a more nuanced approach to human evolutionary history and questions scholars can better model the complex processes that lead to the emergence of modern humans. Recent work shows that hybridization may have played a key role in the origin of our species (Ackermann, Mackay, and Arnold 2015). To me, the claims that Neandertals painted cave art, carved images, and created structures are evidence in support of a more human definition of humanity, one that is informed by both evolution and anthropology. The ability to navigate complex social networks, to trade and exchange not just genes but ideas and objects, has its roots farther back than previously recognized. Humans today send countless nonverbal messages via our clothing, hairstyle, tattoos, and jewelry. Why adorn your body with shell beads (used by at least 100,000 years ago and possibly as far back as 300,000 years ago) unless you want to signal something about who you are? Reframing the question removes the need to delineate who is human and who is not, a question that can have invidious social implications. When Jane Goodall reported chimps using tools, Louis Leakey allegedly replied, “Now we must redefine ‘tool’, redefine ‘man’, or accept chimpanzees as humans.” If what makes us human is our shared evolutionary history, it is a much longer and more complex history than we previously recognized. Marc Kissel is a lecturer in anthropology at Appalachian State University. His research includes the study of modern human origins, semiotics, Neandertals, and the evolutionary arc of human warfare. His first book, written with Nam Kim, Emergent Warfare in Our Evolutionary Past was published in March of 2018.